English Workshop I. One-Week Diary 以下為瑪莉一週的心情日記：. 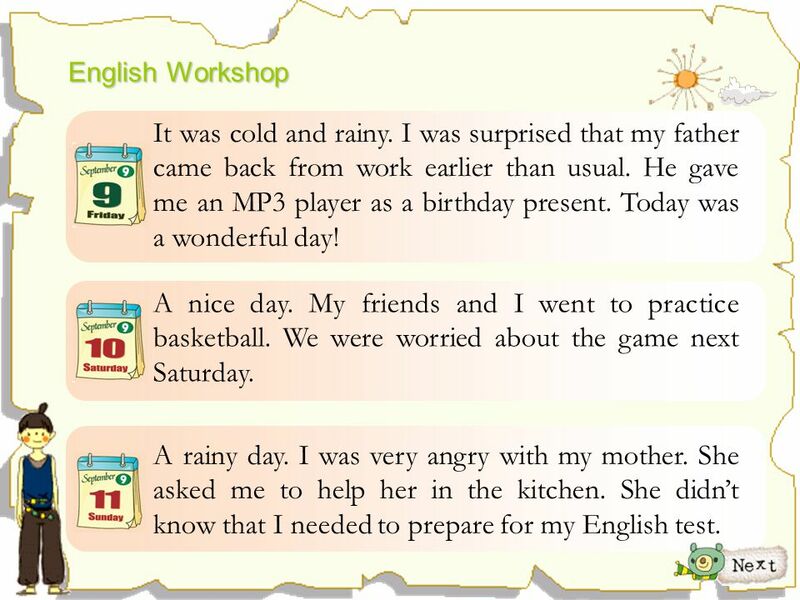 English Workshop A rainy day. I felt sad that my best friend moved to Taichung today. I knew that I would lose a good friend. A sunny day. I got 100 on the math exam. I was very happy about my grade. A hot day. I felt bored because our English teacher gave us a lot of homework. I went to bed at midnight. I was looking forward to tomorrow. I felt excited about the coming of my birthday. 3 know that I needed to prepare for my English test. English Workshop It was cold and rainy. I was surprised that my father came back from work earlier than usual. He gave me an MP3 player as a birthday present. Today was a wonderful day! A nice day. My friends and I went to practice basketball. We were worried about the game next Saturday. A rainy day. I was very angry with my mother. She asked me to help her in the kitchen. She didn’t know that I needed to prepare for my English test. 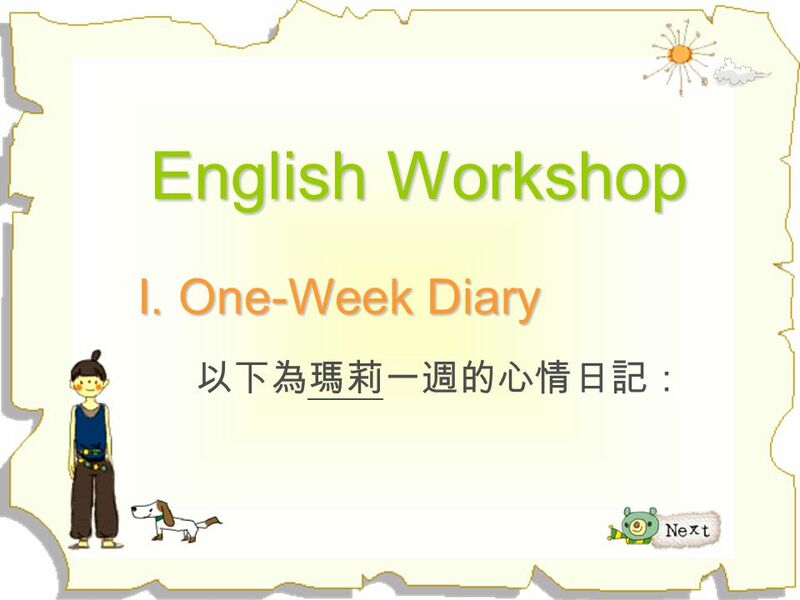 English Workshop 請利用以下表格中的形容詞來描述瑪莉每天的心情，並完成句子。第一句為範例。 worried happy excited sad angry bored surprised 1. 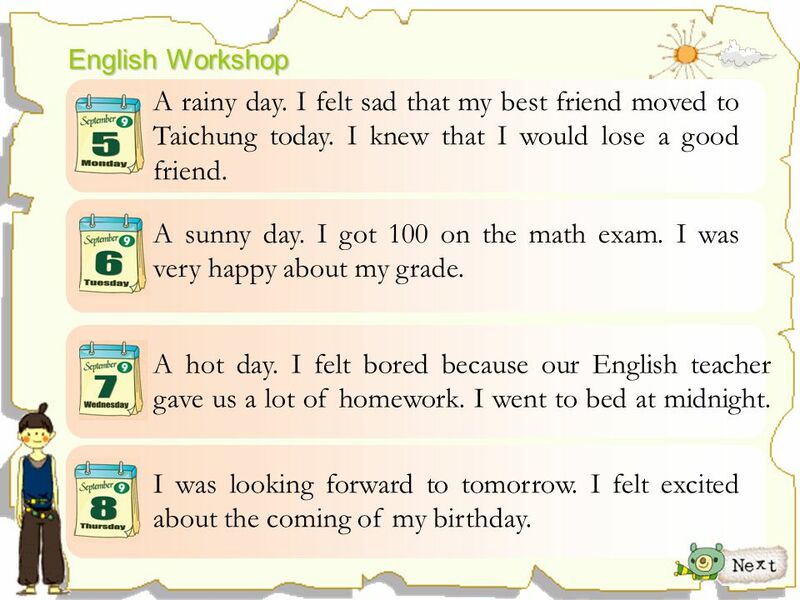 Mary felt sad on Monday because her best friend moved to Taichung . 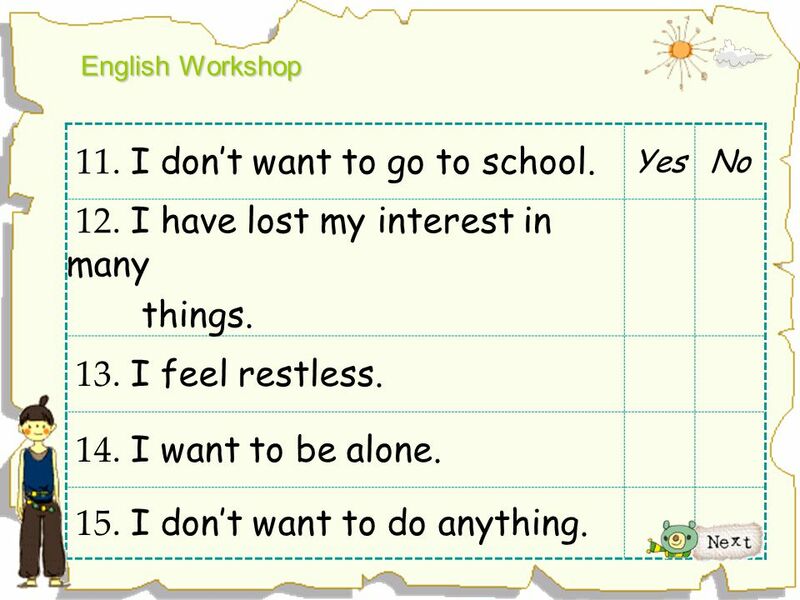 English Workshop 5. Mary felt on Friday because . surprised her father gave her an MP3 player 6. Mary felt on Saturday because worried she and her friends would have a basketball game next Saturday. 7. Mary felt on Sunday because angry her mother asked her to help in the kitchen. 8 1. I have become less patient than before. English Workshop 1. I have become less patient than before. Yes No 2. I have become more irritated than usual. 3. I hope to leave my present life. 4. I get angry more easily than 5. I am in a very bad mood. 9 7. I don’t feel good. energy most of the time. English Workshop 6. I feel lazy all day long. Yes No 7. I don’t feel good. 8. I feel pain in my chest. 9. I feel that I don’t have any energy most of the time. 10. I have trouble sleeping. 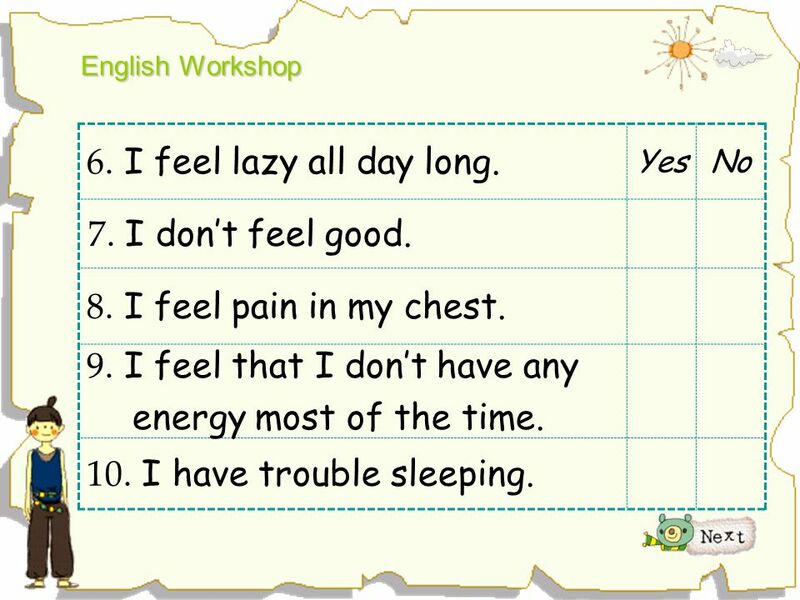 English Workshop 11. I don’t want to go to school. Yes No 12. I have lost my interest in many things. 13. I feel restless. 14. I want to be alone. 15. I don’t want to do anything. 11 16. Whatever I do won’t make me a better person. 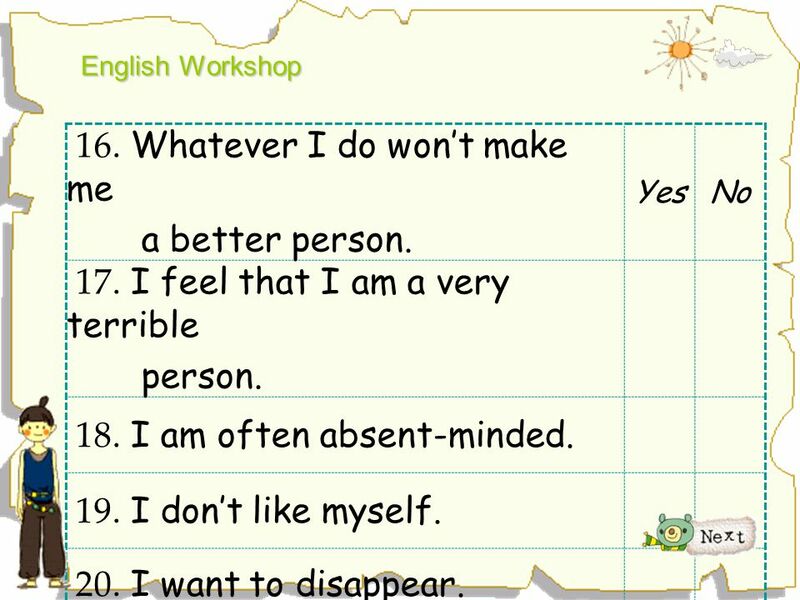 English Workshop 16. Whatever I do won’t make me a better person. Yes No 17. I feel that I am a very terrible person. 18. I am often absent-minded. 19. I don’t like myself. 20. I want to disappear. 12 English Workshop 計分方式：勾選 “Yes”表示 1分，勾選 “No” 表示 0分，將所有20題項的分數相加，就可以知道 你的心情狀態了！ Below 5: Very good! You are a person who knows how to relax when you are under pressure. Keep up the good work. 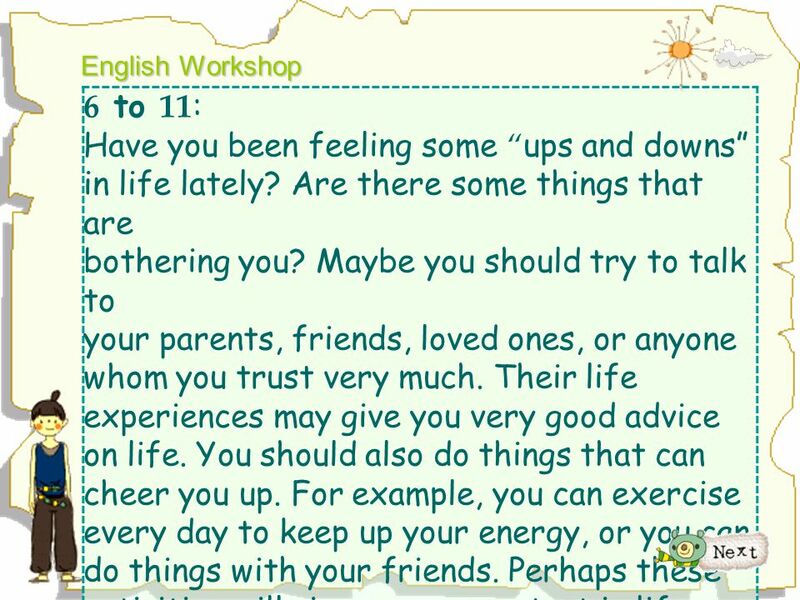 English Workshop 6 to 11: Have you been feeling some “ups and downs” in life lately? Are there some things that are bothering you? Maybe you should try to talk to your parents, friends, loved ones, or anyone whom you trust very much. Their life experiences may give you very good advice on life. You should also do things that can cheer you up. For example, you can exercise every day to keep up your energy, or you can do things with your friends. Perhaps these activities will give you a new start in life. 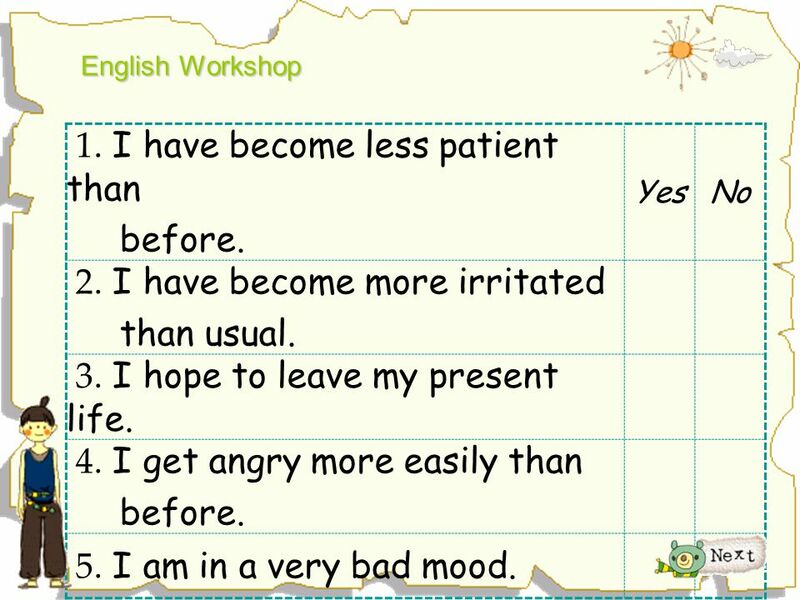 Download ppt "English Workshop I. One-Week Diary 以下為瑪莉一週的心情日記：." 4\248 A big typhoon When Sam was just a little boy, he and his family had a terrible experience. terrible It was a warm summer day, but in the afternoon. 1. S (+ Aux) + be + Vpp 2. It seems that + S + V…. → S + seem(s) to + V…. : Hey, Julie. Have you heard the news? Willy is not seeing his girlfriend anymore. : Well, he didn’t tell me about it, so I guess he doesn’t want everyone. 過去式 past tense 過去式：描述過去的事情，動作，狀態 製作人 : 林逸昀老師. 過去時間 常見的過去時間： 1. ＿＿＿＿＿ 昨天 2. Yesterday + ㄧ天內的時間 e.g.____________________ 昨天早上 _____________________ 昨天下午.    N + who/which/that + be Vpp...  N + Vpp...  Tag Question. S + have/has + Vpp one of + the + 形容詞最高級 + N + (that) + I/we + have + ever + Vpp. Grammar in Use S + Vi + SC S + Vt + O + that-clause. 第一章.  簡單式之被動語態  開竅要訣  Test yourself  Advice  現在式被動 : S+am/is/are+P.P  過去式被動 : S+was/were+P.P  未來式被動 : S+will be+P.P. : OPENING DOORS ? 題組： Problem Set Archive with Online Judge 題號： 10606: OPENING DOORS 解題者：侯沛彣 解題日期： 2006 年 6 月 11 日 題意： - 某間學校有 N 個學生，每個學生都有自己的衣物櫃.